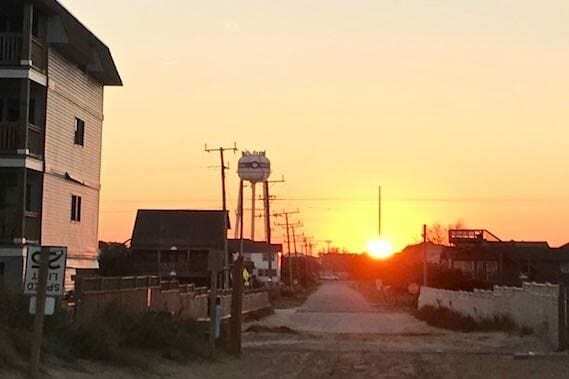 Work will soon begin on replacing Kill Devil Hills’ landmark water tower. The elevated 250,000-gallon tank behind the town fire department on U.S. 158 will be replaced with a 400,000-gallon upgrade. Antennas around the top of the old tank will be moved to a new 180-foot-tall monopole, according to the plans. Once a new storm drainage system, new pipes, the monopole and the new tank are up and running, the old tank will be torn down. The work, by Landmark Structures, wil cost $2,855,000 and is expected to be complete Feb. 1, 2020. The current, 50-year-old tower, can be seen for miles. The unanswered question is, will the new replacement tank be an elevated tank or sit on the ground? The story leads us to think the new tank is going to be on the ground. Certainly a change in the landscape view of downtown KDH. Would it matter if it was in the air or on the ground? Sounds to me its a much need improvement all the way around and all other towns should follow suit! It will be a tower similar to the new Nags Head water tower at 8thst.